The weather is muggy, your shorts look as tired as you feel and you just don't want to make another meal. Thank goodness, Thursday is Crazy Daze in Northfield. Don't let the name fool you; this event lasts one day only. Stores will open at 7 a.m., so you can grab your morning coffee at one of downtown restaurants and beat the heat if you wish. If you're still snoozing until the sun is high, that's no problem. There will be bargains and activities all day. For a complete schedule, check out the Northfield Area Chamber of Commerce calendar. Sure there was live music and face painting, a warm summer breeze and lots of friends to share good conversation. But let's be honest. Thursday night's debut of the Taste of Northfield was all about the food. Hundreds of people stood in long lines, then fanned out through Bridge Square with plates and and cups and paper-wrapped samples of everything from pizza and burgers to Indian dishes and cookies. People shared picnic tables, perched on the edge of the fountain, sprawled on the ground or just noshed as they walked and visited with friends. And then they headed back into line for more. 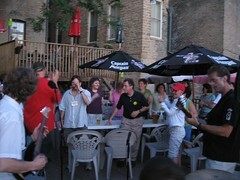 The event, a new addition to the Third Thursday tradition, was cooked up by the Northfield Downtown Development Corporation and local restaurants, including, Chapati, Tiny's, Rueb 'N' Stein, Bittersweet and Quarterback Club. Click here to see more photos of the event. As the sounds of the Northfield Community Band Concerts and the sparkles of the 4th of July Fireworks begin to fade, don't worry, be happy, 'cause the entertainment action continues in Downtown Northfield. In fact, the century-old tradition of Thursday night community cultural celebrations in Bridge Square, the very heart of Northfield, continues through the summer. On Thursday, July 13, it's the Songs of Hope and Pie on the Square sponsored by the Northfield News and Cub Foods. On Thursday, July 20, it's an NDDC Third Thursday Event: the first Taste of Northfield with local musicians. On Thursday, July 27, it's the Chamber of Commerce Retail Committee-sponsored Crazy Daze followed by the Opening Concert of the Vintage Band Festival and a street dance. On Thursday, August 3, it's the Bridge Chamber Music Festival and ArtSwirl sponsored by the Northfield Arts Guild. Eat (or throw) pie, dress funny, listen to good music. Be happy! Dan Bergeson is president of the NDDC. A video installation by Mel Racho, curated by Lisa Otte. Opening reception: Friday, July 14, 6-9 p.m. Show runs through July 23. Between the sensational accounts of sneaking groups of illegal immigrants across the border and the relative ease with which people of wealth can enter the U.S. lies another story – the “moderate” immigration story. This more temperate immigration account is told in “Why are you here? (And where is your accent? ),” a new video installation by artist Mel Racho. City crew members T.J. Heinricy, Steve Malecha and Bryan Haugen hauled a nearly 100-year-old heavy oak desk from the Northfield Historical Society store back into its old home at the Northfield Public Library where it will serve a new role as reference desk upstairs. Though most recently used at NHS, the 1909-10 desk has resided in many places in town. After the 1985 addition at the library, it served Paul Hager and the staff at NTV. Then in 1998, to celebrate the library's centennial, it was part of the display at the Historical Society. When the NHS store expanded and they needed a check-out desk, it moved into the store. Now NHS Has remodeled again and the desk has come back home. Who knows, It may also bring back the "spirits" of past librarians Constance Doty, Shirley Merill, Marsten Headley and Leota Stewart! 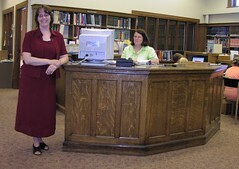 At one time all the library transactions were handled at this desk. Times have changed! If you just can't wait for the holiday weekend to begin you can head downtown Thursday night. 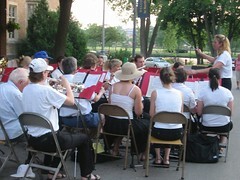 The Northfield Community Band, under the direction of Claire Larson, kicks off its weekly concert at 7:30 pm Thursday in Bridge Square. Claire and her band of volunteers, who range in age from 14 on up, will be playing another program that will bring back the feel of an old-time summer evening in Northfield. People who come are encouraged to bring lawn chairs or blankets. Concerts are free, and the folks from the Senior Center will be selling popcorn, so you can munch in time to the music. The Northfield League of Women Voters (LWV) will continue its "4th Monday" public meeting series tonight, June 26, to discuss expansion of the Northfield Carnegie Library. The library director, Lynne Young, along with board members and a consulting firm representative will be present. The library's needs, as identified by library consultants, and the additional square footage requirements for an enlarged facility have raised concerns about finding adequate space to keep the library downtown. A short tour of the current library building will begin the meeting. Call 663-6097 for further information. A group of Spanish teachers in town for a seminar at Carleton were at the Contented Cow last night, whipped into a frenzy by Jellystone Yogi (Joel Cooper on bass, George Marich on drums, Peter Diggins on guitar). You can click the photo to enlarge, and click the icons below to play the three short (10 - 30 seconds) videoclips. La Bamba! Cooper and Diggins perform again tonight at the Cow, part of the Prairie Creek Group. Despite moving away to college in a strange and faraway land, I noticed that recent updates to Google Maps have yielded higher resolution aerial imagery of the area. Bird's eye views of sights such as Sechler, Malt-O-Meal, downtown, and your roof await! Don't venture too far north, as it appears that Randolph hasn't yet thawed. Aren't you glad time flies? The weekend is almost upon us again! It will be another great weekend for music. Downtown is hopping on Third Thursday with the Community Band Concert at Bridge Square. Why not stay downtown for dinner at one of the fine establishments listed in the Northfield Entertainment Guide and hear Chris Herriges at the Tavern or the Hamlin/Pernecky Jazz Duo at the Contented Cow? The Northfield Historical Society's Museum Store is undergoing a facelift. On June 8th, Northfield Construction came in and started the demolition of the old store to make room for the new store. The new construction will open up more space in the store for inventory and displays. The new store will also allow us to have room in our old admissions area for the Founding of Northfield Exhibit which should be open to the public by the 4th of July. The store's construction is scheduled to be completed by June 23. Don't worry, though, the museum is still open and we are giving tours. In addition, we have a temporary store set up for our visitors. We are open normal hours Monday through Saturday from 10 a.m. to 4 p.m. and Sunday 1 p.m. to 4 p.m. There may be some closures to the store and museum for construction of the new exhibit, however.